Last week on the new Q & A segment of The Organised You TV, I talked about the importance of routines and systems in staying on top of your organisation - for your home, your family, and your general peace of mind! Being organised in your day-to-day life not only gives you back valuable time, but can give you greater focus, productivity and efficiency in other areas of your life. Having some simple routines and systems in place will really allow you maximize your time and focus on those things you really want to spend time on. With the inevitable ‘busy-ness’ of life that everyone experiences, it pays to invest the time into setting up systems that will make you feel less stressed and overwhelmed. I have found that one of the best things to do is to write things down - your routines, tasks, plans and goals. Writing things down helps them stay in your mind longer; gives you that visual reminder; and gets the endless stream of thoughts out of your head. That's why I created The Productivity Pack. 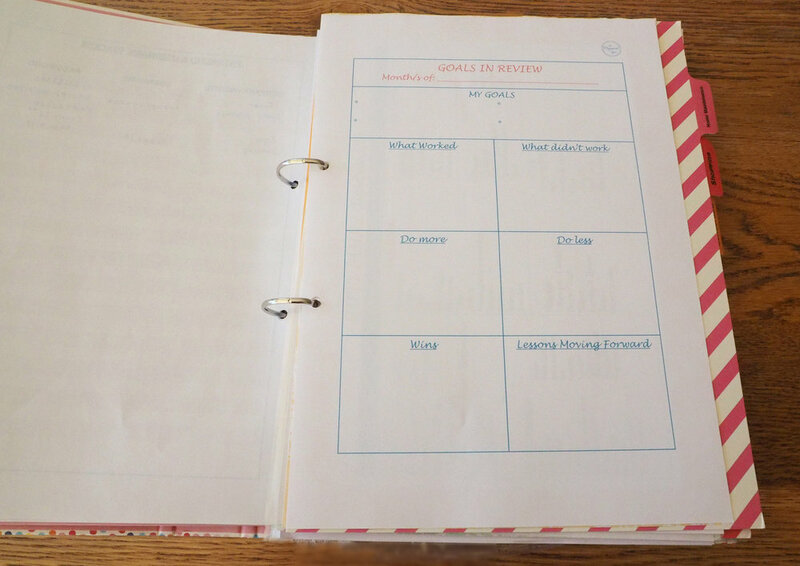 This handy pack includes 30 printables, with a variety of layouts to choose from in the areas of planning, tasks, routines and goals. It is designed to help you better organise your family, home and life, and be more efficient and productive with your time! The biggest change I've recently made to my daily routine has been utilizing a categorized weekly planner. A few months ago, I stumbled upon a podcast episode that was focused on how to reach Inbox Zero on a daily basis (something I struggle with!). While discussing how to achieve this, April Perry of LearnDoBecome was talking about how to more effectively plan your tasks and projects. Having these separate categories allows you to get through your to-do list with greater efficiency, as the tasks are grouped together by type. Rather than looking down a huge list of tasks and wondering which one you should choose on a particular day, you can instead plan your time and schedule according to the task type. For example, if you have 3 different errands to run one week - post a letter, buy a gift and return library books - the aim is to do them all in one session or outing, rather than over the entire week, in order to be more efficient with your time. If you’ve got a few different phone calls to make, you could get them all done in one sitting, as you’re already sitting down with your phone (and possibly a calendar or diary), and you’re in that frame of mind for making calls. The same goes with computer tasks, whether it’s filling out an online form, paying a bill or making an online appointment - if you do all of these similar tasks in one sitting, it's a more effective use of your time. I find the best time to plan out my upcoming week is on a Sunday evening, when the ‘busy-ness’ of the weekend is over, and I can focus on the week ahead. Along with categorizing the different errands, I also prioritize my top 3 tasks for the week to make sure I definitely get these things done. These tasks have already been listed in the categories, but they are my ‘must-do’s’ for the week - even if I get through nothing else, I’ll at least have accomplished something! 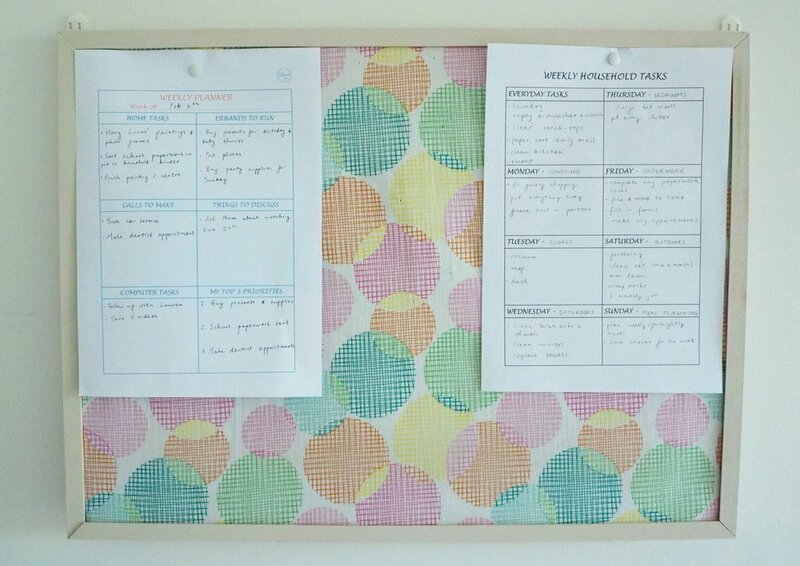 I like to have 2 copies of the planner pinned on my cork board - the current week and the following week, so I can automatically pop in anything that can be left for the next week when/if it arises. The Productivity Pack has a few different layouts for weekly planning, as I know that one method or layout doesn’t suit every person. So you can experiment or mix it up with the different weekly planner layouts - whether that’s categorizing task types; separating tasks into days of the week; or assigning 3 top priorities for each day, it’s up to you! There are also options for planning out your household chores - something we all know takes up a lot of time, especially if you have a big family or young kids that go through clothes at a rate of knots! So far, the start to this year has been all about goal setting for me. It's my new favourite thing to do! I’ve done loads of research into best practices for goal setting, and the theory that resonates best with me personally, is 90-day goal setting. Oftentimes, those well-intentioned resolutions and goals we set on New Year’s Eve don’t actually work out, simply because a year-long goal is just too much of a stretch for our brain to actually focus on. There is less accountability, both to yourself and from others, when the period in which to achieve the goal is too long. Therefore, 90 days is a much more reasonable amount of time in which to achieve a goal - not too long, not too short! It also allows the goal to be more specific, with measurable results. My husband and I did this 90-day goal setting activity together, and separated our goals into the categories of Health, Wealth, Family and Home. Under each different goal that we set, we listed action steps for how we wanted to accomplish it i.e. ‘Improve Fitness Levels’ had the action steps of exercising 5 mornings a week, drinking less alcohol, and preparing healthy lunches on weekends so there’s no excuse for not having a healthy option at lunch. Seeing as health and fitness go hand-in-hand, we wanted to create some more healthy habits that would then [hopefully] influence our fitness levels. So far so good on the morning exercise front - woop! Are we always going to be perfect and achieve all our goals? Maybe, maybe not - we’re only human so things won’t go perfectly all the time! (she says as she polishes off the remains of a birthday chocolate cake….). But having these goals written down, with clear action steps for each goal, and being accountable to each other and ourselves, is a great visual reminder. We also plan on using the goal reflection sheet at the completion of the 90 days (in April) to review our goals and assess what worked and what didn’t; what we need to do more/less of; wins; and lessons moving forward. If you’ve been following along with the blog for a while, you’d know that home binders are totally my jam! I have a household binder, finance binder, recipe binder and house inspiration binder, and use all of these on a fairly regular basis. The most helpful one is definitely our household binder. Within this binder, there are sections for important information related to medical, utilities, insurance and personal information, such as account and policy numbers, phone numbers, usernames and passwords. Having just had to fill out a stack of forms for my children who are starting school and kinder, it was such a time-saver to have all this information right on hand rather than having to search for it. I was feeling very thankful that I'd invested the time in setting up the binder properly! A finance binder has been another fantastic system to have for tracking debt repayments, savings, and budgeting. It also provides the perfect spot for setting specific financial goals - whether it’s paying off debt or saving a specific amount in a set time-frame. We aim to have a finance or budget night once a month, and it's a routine that has been useful in tracking where our money is actually going! You can find all the household and finance binder printables within The Productivity Pack. At only $9, The Productivity Pack is a worthwhile investment in giving you back more time in your day. Used effectively, setting up these systems and routines for your home can really increase your productivity and efficiency, and allow you to feel more on top of your tasks. My mission behind The Organised You is to help you feel less stressed and overwhelmed, and more in control and calm. I’m convinced that The Productivity Pack will be a positive step in helping you to get there! Older PostAnnouncing: A new segment of The Organised You TV!